When Noah’s parents were in town this weekend, I needed a quick side dish to go with sandwiches. I threw together a few things I had on hand, and voila! 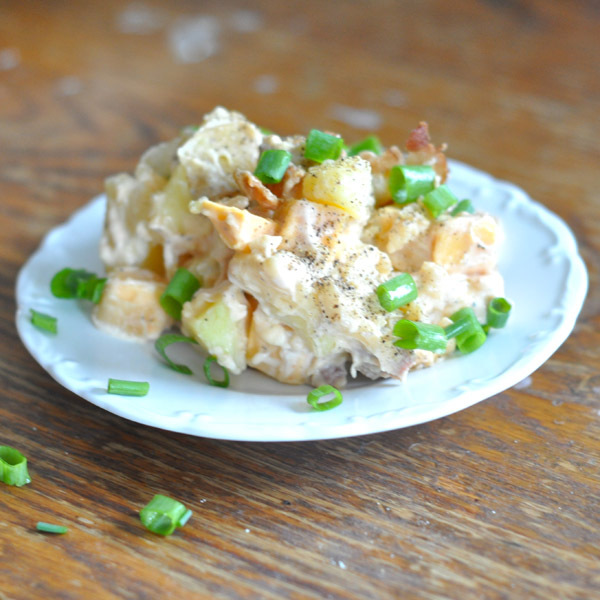 Twice baked potato salad was born. Boil the red potatoes until soft. You want them a little softer than traditional potato salad, since this resembles a twice baked potato, but not falling apart. Drain, and rinse with cold water until not hot. When cooled, slice potato into pieces and set aside in a large bowl. Fry the bacon in the olive oil until crisp…crumble and set aside. Put onion and garlic powder in the bacon grease and cook until translucent. At the very end (maybe the last 3-5 minutes), add the bacon back in. Cool mixture. In another bowl, mix salt and pepper, mayo, hot sauce, and ranch. Add cheese and fold in; add bacon/onion mixture (with grease) and fold in. Add this mixture to the potatoes and fold gently…you don’t want the potatoes to completely fall apart. Everybody loved this! It’s not a very difficult dish, and would be a hit at a pot luck or a shower.